Most of us will agree a cruise is better than a stay in a hotel on land. And cruise lines have generally done better in marketing their product. But it’s becoming time that perhaps cruise lines should start living in the real world and take a cue from their colleagues in the hotel industry. Specifically, the cruise industry needs to step back and think about how they promote new “hotels” they are building. They need to think about how the world has changed in the last forty years and realize they are still doing things the way they did back then. Lots of people post their vacation photos to their social media accounts. Thanks to internet at sea, they can even do it realtime. 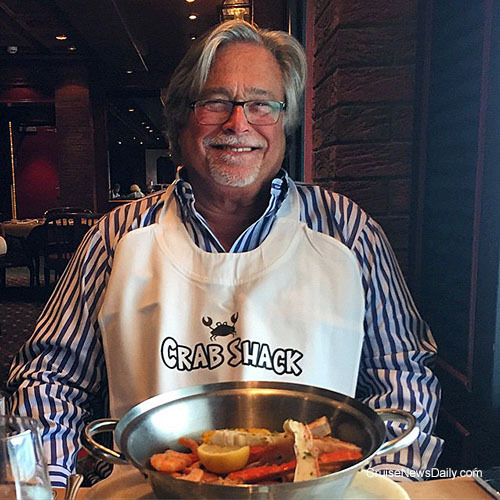 Carnival Corp Chairman Micky Arison seems to be on vacation this week on a 10-day Alaska program that has included a trip to Denali National Park, and he is now cruising on Coral Princess. He is doing all the things a typical traveler would do on vacation - and he is having a ball. He’s in awe of the scenery and it would seem a very satisfied customer. Like so many others, he’s posting pictures to his Instagram account - including selfies like this one where he is having dinner in the Crab Shack aboard Coral Princess. Here is a link to his Instagram account in case you want to follow along with his vacation. 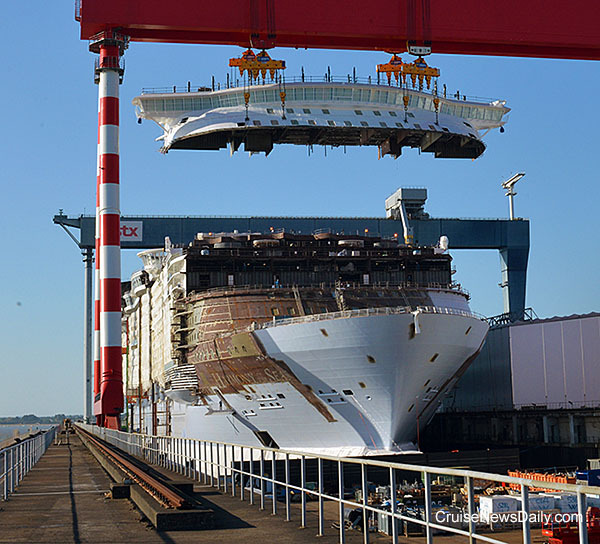 Royal Caribbean’s third Oasis-class ship, Harmony of the Seas, is currently under construction at STX France in Saint-Nazaire. Thursday was a milestone when the navigational bridge was lowered into place. More photos are on our Pinterest board. P&O's Adonia to move to a new "social impact" brand call fathom. (Yes, it is spelled with a lower case.) The brand will launch from Miami to the Dominican Republic in April 2016. Carnival says fathom "will offer consumers authentic, meaningful impact travel experiences to work alongside locals as they tackle community needs. What sets fathom apart is the long-term, systematic partnership approach with its partner countries paired with the unique business model that allows for sustained impact and lasting development. fathom's scale and global vision reach beyond what the world has ever seen." The brand will be led by Tara Russell, Founder and Chairman of Create Common Good, a food production social enterprise. "Travelers will work in partnership with proven, trusted local organizations on the ground to amplify their missions for far greater, sustained impact," Russell said. "Because fathom will bring hundreds of travelers to a destination on a regular basis, fathom can achieve focused and holistic, collaborative contributions in a broad region of the country - allowing fathom travelers to make a collective, transformative impact that they know will extend far beyond their involvement. They also will know they played an important role in ensuring the region flourishes. We are excited about making the Puerto Plata region of the Dominican Republic our first partner destination, and we are optimistic about taking all that is being built in and through fathom to other global destinations and to the broader Carnival corporate family." Azamara Club Cruises said today they have set both of their ships for “major upgrades” early next year. Azamara Journey will be transformed during dry dock in the Bahamas in January 2016, and Azamara Quest will undergo a similar process in Singapore in April 2016. Celebrity Cruises has an interesting new advertising campaign to promote the line’s difference from other lines. They are using line, the grass is always greener, to send the message they are a little better, and of course, that ties into the half acre of real grass atop the Solstice-class ships, something which is unique to Celebrity. 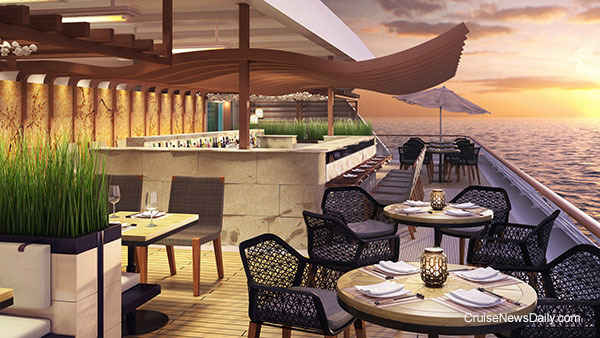 Seabourn Encore is set to be delivered at the end of next year, but Seabourn is already releasing some of the design details of the major public spaces. Making them a little more noteworthy is that the interiors are being designed by noted hospitality designer Adam Tihany. 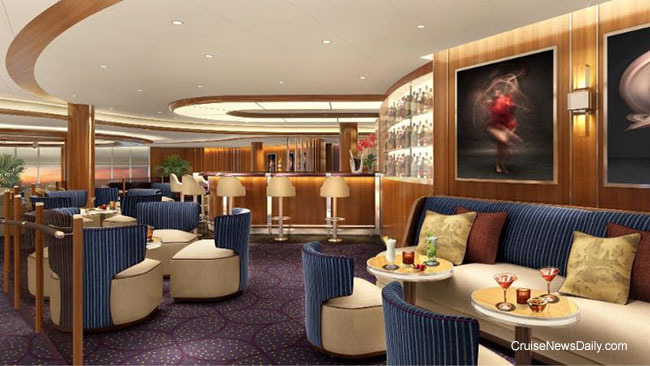 The latest to be revealed is The Club which will be the central lounge for the small (40,350-ton) vessel. But it will be more than a lounge. The complete article appeared in the June 2 edition of Cruise News Daily. Image courtesy of Seabourn Cruises. All rights reserved. May not be copied or used without permission. The complete stories appeared in the June 2 edition of Cruise News Daily. 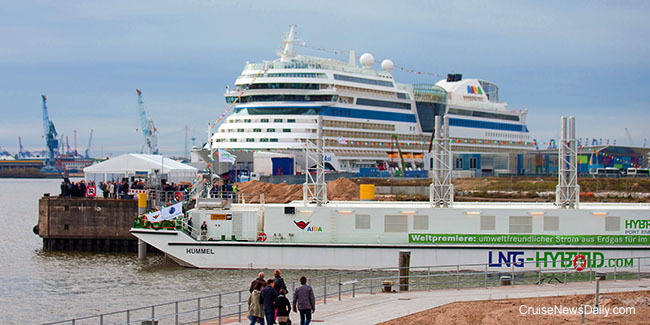 Several months ago we told you about Carnival’s AIDA unit partnering with Becker Marine to develop a barge that could power ships by use of LNG (liquified natural gas). That project became reality on Saturday when Becker’s LNG barge The Bumblebee powered AIDAsol during its time in port at Hamburg. 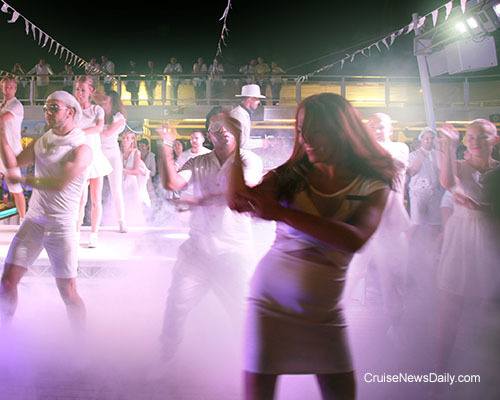 The new White Party aboard P&O Australia Cruises. Photo courtesy of P&O Australia Cruises. All rights reserved. May not be copied or used without permission. Geneva, 1 June 2015 – MSC Cruises S.A., the world’s largest privately-owned cruise line and market leader in the Mediterranean, announced today that Massimiliano Mio had joined the Company’s executive leadership at its global headquarters, in Geneva, Switzerland, as the new Chief Legal Officer (CLO), effective today. Mr Mio has worked in international shipping law for 20 years, covering claims and disputes handling, insurance and liabilityissues, corporate legal affairs and various other maritime matters. He will report to Chief Executive Officer, Gianni Onorato. CEO Gianni Onorato said: “Having grown by 800% in the first 10 years alone, MSC Cruises is poised for a further dramatic expansion through a €5 billion plan to double our current fleet capacity by 2022, which includes seven ultra-modern ships in two pioneering prototypes. Mr Mio served most recently as General Counsel for RINA S.p.A, the global provider of certification, testing, inspection and engineering consulting services in multiple sectors, including marine, transport and the environment. While there, Mr Mio led legal teams through numerous complex lawsuits, and piloted a project to restructure RINA’s insurance programme. Massimiliano Mio is the fourth new C-level appointment by MSC Cruises in 2015, following the arrivals of a new Chief communications Officer, Chief Information Officer, and Chief Marketing Officer.